The pre-pharmacy program is administratively located in the School of Pharmacy and the faculty advisors are members of the School of Pharmacy faculty. The pre-pharmacy curriculum consists of a minimum of three years of course requirements. This curriculum may be completed at the University of Mississippi or another four-year institution. The first two years of courses may also be completed at a community college. Completion of the pre-pharmacy requirements will not ensure admission to the professional degree program. Final decisions regarding admission to the professional degree program will be made based on procedures developed by a faculty committee. 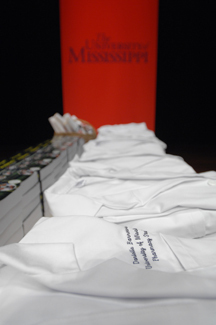 Admission preference will be given to applicants who are Mississippi residents and United States citizens and to non-Mississippi United States citizens who complete the all required pre-pharmacy courses at the University of Mississippi. The program is open to both residents and non-residents of Mississippi. The early-entry program provides the opportunity to engage in both professional and personal relationships with School of Pharmacy faculty and upper-classmen immediately upon entering the university. Early-entry students avoid the highly competitive selection process for admission to the B.S.P.S. program following completion of the pre-professional curriculum. These students also are eligible for scholarships unavailable to pre-professional students. Eligibility for early-entry admission requires a minimum composite ACT score of 25 (Math subscore of 25) and sufficient GPA (9-12 grades, 4.0 scale) that when multiplied by ten and added to the ACT score equals at least 65. If a student does not meet the minimum ACT Math subscore, they may take prerequisite courses for biology and chemistry in order to enroll.